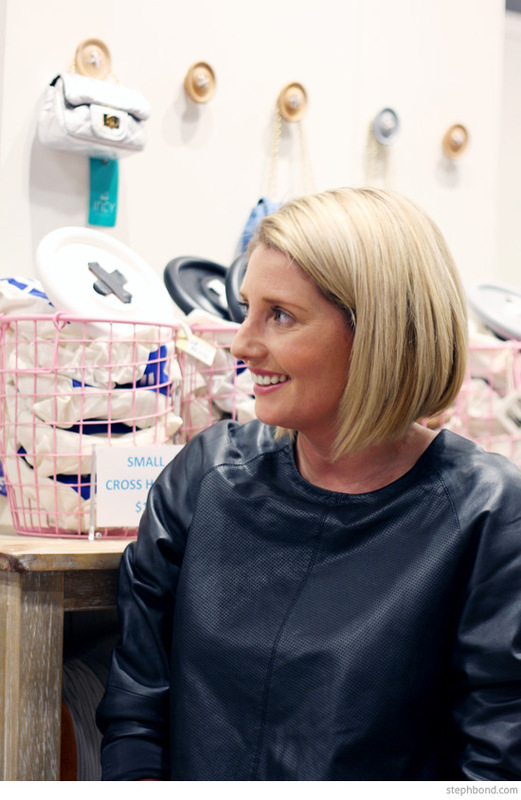 Belinda Kurtz from Petite Vintage Interiors has good hair. Great hair in fact. 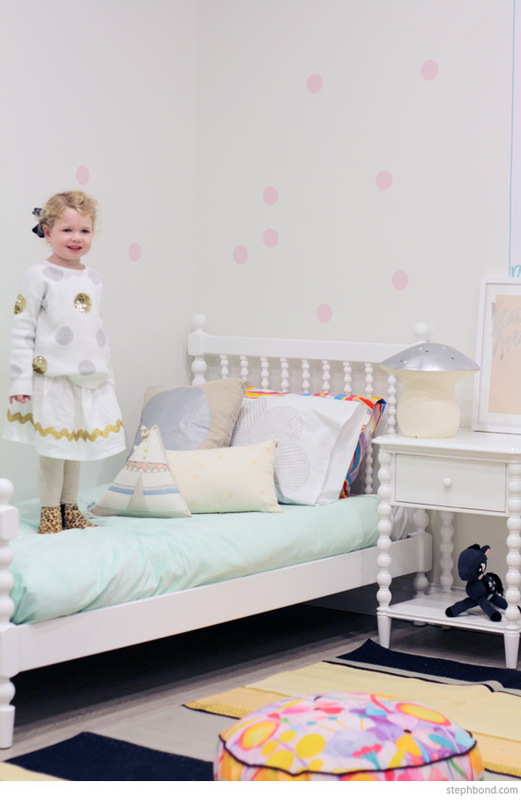 So is that the secret to being a great children's interior designer? 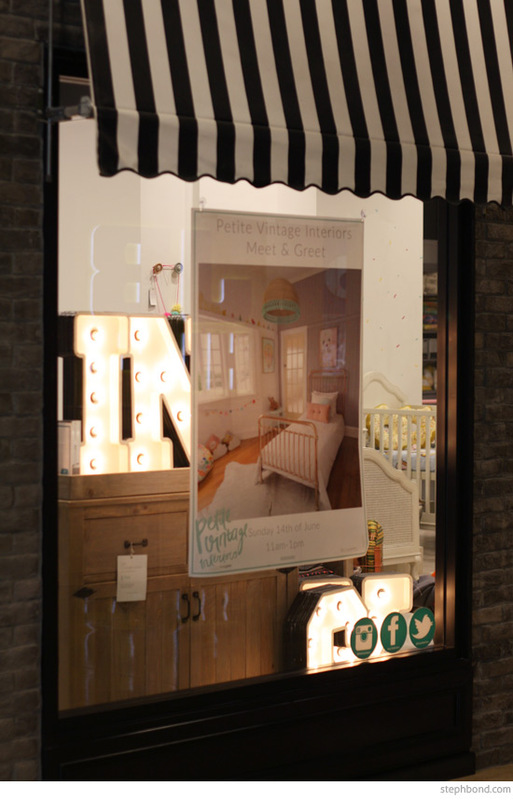 The truth is that Belinda's personal style is part of her trade secret - her signature interior design look is replicated by clever Mamas everywhere (just check the #petitevinspiration hashtag! ), and she has generated a huge following based on both her lovely nature, her style, and the beautiful rooms she designs. 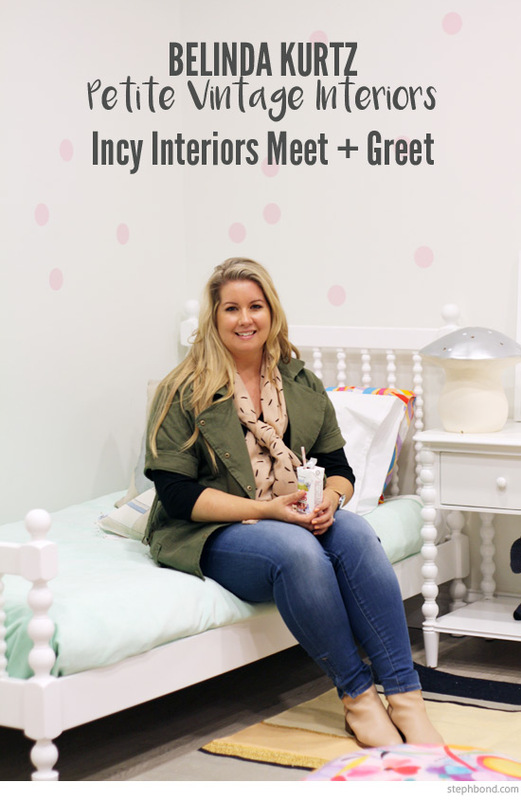 I was lucky to join Belinda at the beautiful Incy Interiors store at Chatswood Chase to watch her style an undressed corner of the store, teach us how to perfectly place wall decals, give us her five top tips for decorating kids' rooms and answer lots of questions about putting together children's rooms Bel-style. Belinda started with a blank slate - a corner of the Incy Interiors store was set up with the Spindle collection in white. 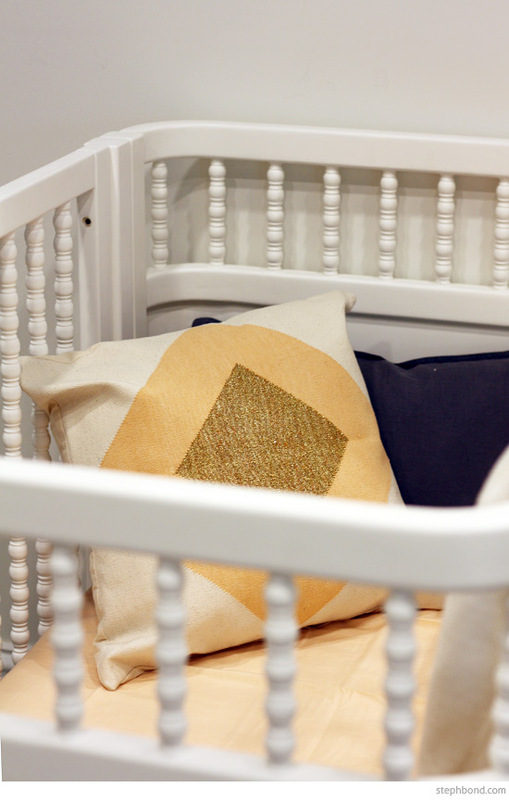 When designing a nursery, visualise it with a single bed and decorate accordingly, as your child may only be in a cot for around 18 months. Make sure you don't have to completely re-decorate the room when they move into a big bed. Identify the "main wall" in the room. This is the first practical wall that you see when you walk into the room - usually the largest wall with no window or anything on it. Use this wall as the feature wall or "show piece" of the room; where you might display artwork, use wallpaper or decals, and where you would position the bed. Choose a bed for longevity - white, timber and metallic (such as the Incy Interiors Eden Bed) are all considered "neutral" and timeless. Position the bed against the main feature wall. 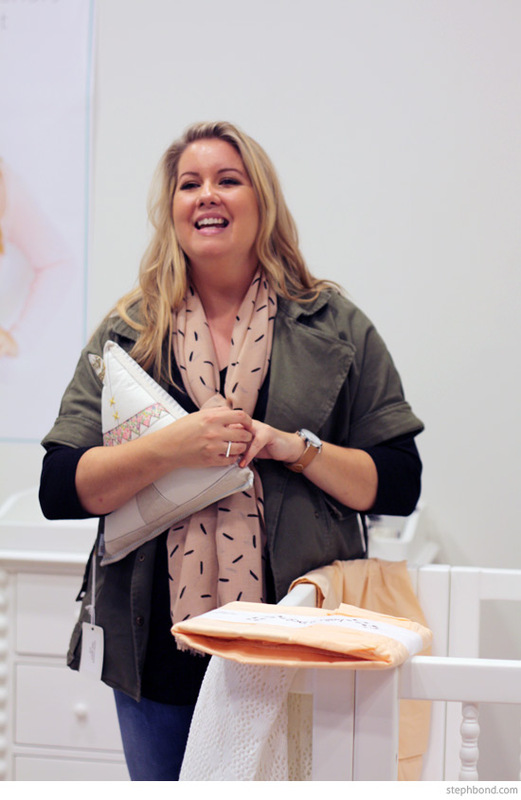 Belinda likes AURA by Tracie Ellis and Hunting for George bedding options in navy and mint. She also recommends Pony Rider for the great textural design (particularly for boys). If you have a busy wall, Belinda suggests using block colour, neutral or no-pattern bedding to provide contrast. She loves the Kip & Co block colour velvet doona cover in spearmint. Keep cots very simple - you only need a fitted sheet and a beautiful blanket which is a great investment as it will be with you for a while. For during the day, you can pop in a cushion or two and hang the blanket over the end of the cot. You don't need a full matching cot set! Incy Interiors has a beautiful ombre peach fitted sheet set from Bella and Lace. Change tables are an additional expense for families, so Belinda recommends using a set of drawers with the top used as a change area. Paraphernalia such as wipes, nappies and creams can then be stored in the top drawer. If you do use a traditional change table, use baskets to reduce clutter. You don't necessarily need a feeding chair in your nursery; choose a comfortable arm chair that you can use somewhere else in your home later. Navy is a great on-trend colour for boys, according to Belinda, and for girls she loves mint with copper accessories. Bel likes metallic for boys too. For a shared room with both boy and girl, use the same bed and furniture for both but try to co-ordinate bedding, rather than match. Use colours for each child that compliment each other (e.g. mint and charcoal). Both beds can also be made up the same, but with more masculine pillow choices for the boy. When using dark colours on walls, try to use lighter or contrasting colours for the bed and bedding to "pop" against the background. Avoid a dark bed against a dark wall. Keep decorative pieces grouped together. Rather than place one artwork on each wall, try to alternate with one decorative piece on each wall such as art print, garland, felt animal head and then art print, to keep the room feeling full without being busy. Consider height in the room; if everything in the room is low, think about a canopy or teepee or tall stand to provide contrasting height. Place artwork on the main feature wall. Belinda doesn't see the point of small artwork on kids' walls unless it is grouped together. She recommends 50x70 (which will fit into an IKEA fram), A3 and larger artworks to make a statement. For A4 and smaller-sized artworks, group them in a cluster. Try Etsy and Society 6 for artwork, where you can search for a theme (such as a superhero or cartoon character) that is treated in a stylish way. 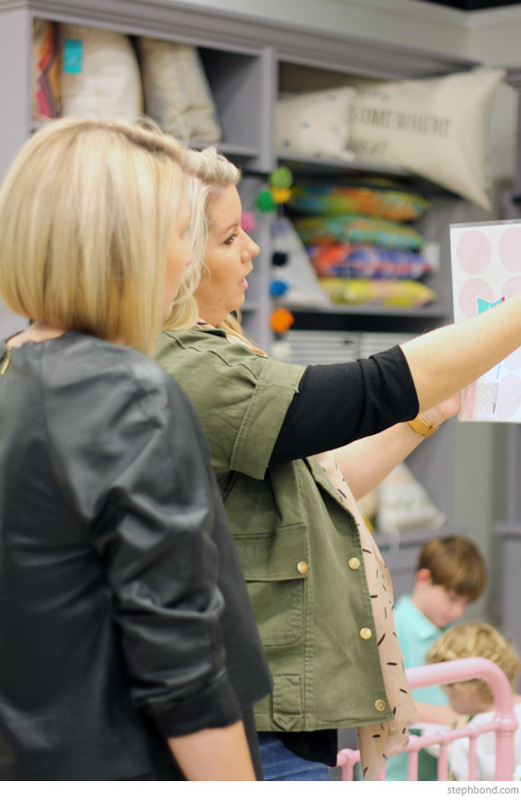 Artwork is a great way to get the children involved in the decorating process, as they can help choose pieces for their room. Wallpaper is on-trend right now but can be very expensive. Use wall decals in a pattern to get a similar look for less that you can change easily. 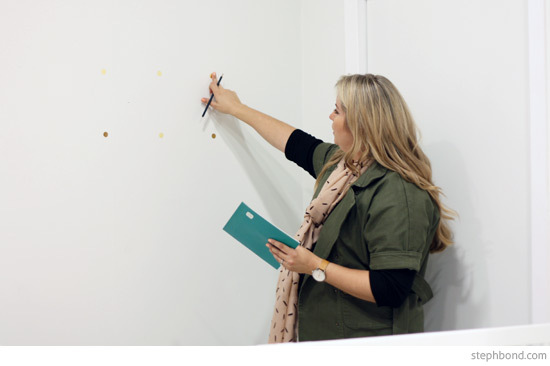 Belinda showed us how to use a piece of cardboard to easily create a perfect pattern using wall decals. To achieve a grid pattern, mark the four corners of the square cardboard on the wall using chalk or pencil, and then cover with a wall decal. To centre decals on alternate rows, simply turn the cardboard to resemble a diamond on each alternate row and mark spots on each corner. Belinda explained that rugs are used for comfort; originally to add warmth and prevent drafts, and now to give you something luxurious to put your feet on when getting out of bed. With that in mind, position the rug so that you can stand on it as soon as you get up. Round rugs look great in kids' rooms, but don't place them in the centre of the room (especially if it is small); keep them close by the bed so you can stand on it in the morning. Belinda loves the Armadillo & Co. Daisy rug. For square or rectangular rugs, place right next to the bed. If a bed is placed in the centre of the room or away from the wall, orient the rug horizontally and place it under the bed, but make sure that the rug is big enough to allow significant border to stand on (plus, rugs are expensive, so you want to be able to see them!). For a room with two beds, place a circular rug between them, slightly towards the front so you can see the detail. Create a zone in the room for your child to play or read - it could be as simple as a comfy cushion, bean bag, tent or teepee, so that they can enjoy the beautiful space that you have created for them. Belinda used the Madeleine Stamer floor cushion to create a relaxed spot to read. If you can, Belinda recommends moving messy toys to another room if possible, or using closed/concealed storage to hide clutter. For beautiful items, use wire storage. If the bed has a frame (not ensemble), Belinda likes to pull the doona up to the level of the pillow and then tuck the doona in on all sides (including the end). Bel likes to use two pillows and then a variety of different-sized contrasting feature cushions. If your child is into a particular theme (like dinosaurs), you can bring that out using cushions. Belinda loves the Little Village handmade triangle teepee cushion. Add a luxurious layer with a beautiful throw or blanket - it's especially nice to be able to use something sentimental, like an heirloom blanket or something handed down. Sturdy, kid-friendly lamps (like the Heico lamps) are a great idea when placed on side tables in reach of kids and their friends. I have two daughters - a teenager and a 6-year-old sharing a room. How can I make that work? Belinda talked about bringing into the room interior items that aren't necessarily "children's" products to compliment the rest of the home. This will make sure that the room isn't too young for the teenager, but can work for the 6-year-old too. My daughter gets cold easily so we like to flip her bed during Winter so that it is against a different wall without a window. Where should I hang wall art and decorative features? Belinda recommended splitting decorative features between the two walls so that they will work for both Summer and Winter. How can I decorate for my child's room that is dark and doesn't have great natural light? Belinda suggested using lighter tones for furniture (such as white and blonde timber), and to avoid heavy, walnut-toned wood. Keep walls white and use minimalist decorating. Work with lamps and generous lighting. What a fabulous event. 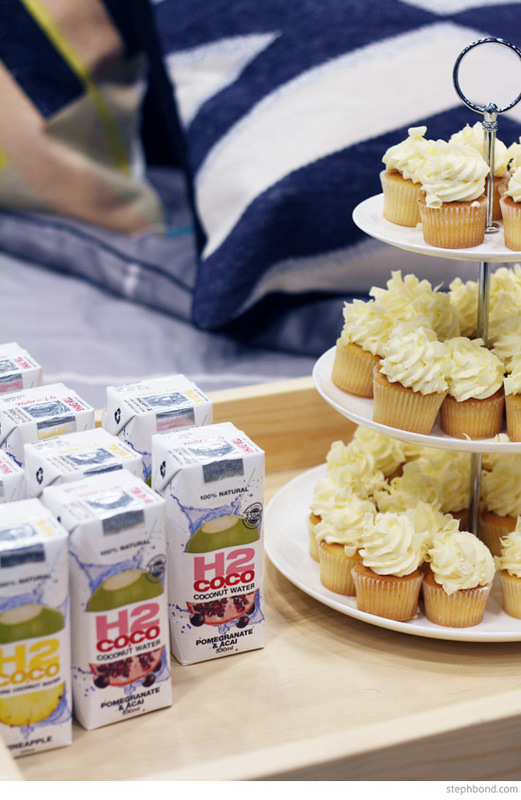 Thank you to Bondville sponsor Incy Interiors for hosting the Meet and Greet and for the delicious cupcakes and coconut water to keep our energy levels topped up. Can't wait to catch up again Bel - maybe you can give us some of your hair secrets next time too.